There are some quite interesting places that lie around Karur that hold importance in terms of tourism as well as in other fields. Dindigul, Namakkal, Trichy, Erode are some of the places lying next to Karur, with which it shares cultural and traditional traits since all of these regions lie in Kongu nadu itself. The language spoken, religion followed, festivals celebrated etc are all the same as Karur. These places are also wonderful places of tourist interest which can be covered during short breaks. 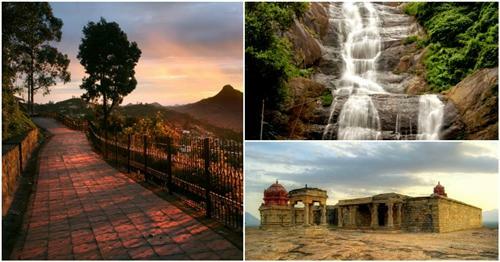 Dindigul has a lot of tourist places since it is high on its natural beauty quotient. The district carries within itself famous hill stations like Kodaikanal and Palani hills. Tucked deep inside within its picturesque landscape are also many other hills, waterfalls, lakes etc like Kodai lake, Green valley view point, Fairy falls, silver cascade falls, Glen falls, Bera shoal falls, Kukkai caves etc which are lush natural locations. Dindigul telescope house, Bryant park, the solar observatory, Coaker’s walk, Orchidorium etc are well known places to be visited in Dindigul. Apart from these, there are also many religious sites and forts which are must visit places in the district of Dindigul. Namakkal district lies in the North western agro climatic zone. There are some scattered hills and valleys all over Namakkal that forms its topography. The district population is mainly into agricultural activities and about 90% of the cultivated area is under food crops. Namakkal has shown considerable growth in other industries like poultry and dairy farming, truck body building industries etc. over the years. Koli hills located near Namakkal town is the key tourist attraction here which holds several interesting spots like Agaya Gangai waterfalls, Boathouse, Peryaswamy temple, Etukkai Amman temple, Arapaleswarer temple, Horticulture farms, herbal farms, pineapple farms etc. Tiruchengode is another important place to be visited which is one of the seven Shivasthalams in the Kongu nadu region. It has the Arthanareeswarer temple, considered to be the oldest temples in the region. Namakkal rock fort is famous for its rock cut caves believed to be built by the Cholas in the 9th century. Sitting at the geographic centre of the state of Tamil Nadu, Trichy or Tiruchirapalli is famous for not just the places it hold but in many other aspects too. Having a rich history, it has been under many great dynasties like the Cholas, Pandyas, Pallavas, Nayaks etc. It is known to be ‘the energy equipment and fabrication capital of India’ considering the large amount of manufacturing units present in Trichy. 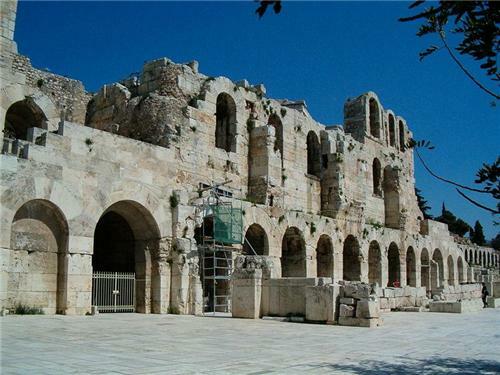 It also has many archaeological and religious legends attached to it. 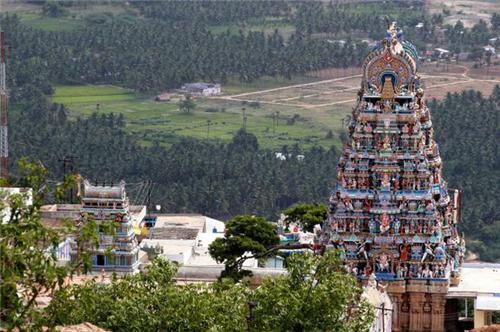 The key tourist locations here are the Ranganathasamy temple which is said to be the largest Hindu temple in the world consisting of 21 gopurams built over 156 acres of land. Also the Rock fort Ganapathi temple, known to be made out of a rock that is said to be 3800 million years old, when visited till the top gives a complete panoramic view of the Trichy city. 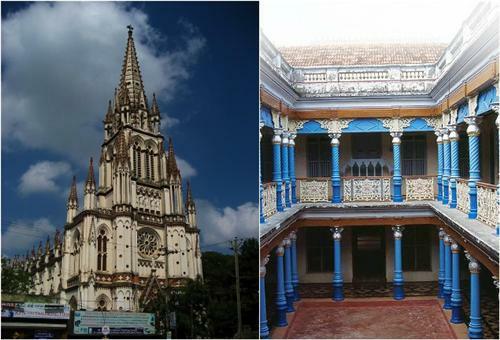 Mukkombu, Kallani dam, St. John’s Church, St. Joseph’s church etc are the other main attractions in Trichy. Erode lies at a distance of 68kms from Karur city is situated on the banks of the river Cauvery and is one amongst the cities ruled by famous rulers like the Pandyas, Cholas and the Nayaks. Erode is known for its handloom, powerloom, oil and turmeric industries and is a good contributor to the state’s economy. Though not much of a tourist destination it does hold some famous and prominent temples like Arudra Kabaliswarar temple which is about 1200 years old and lies in the centre of Erode city. It is known for its famous deities and sculpting. Its grand Shivrathri and Navarathri celebrations are well known throughout. The Thindal Murugan temple, the 750 year old architectural beauty is situated atop a hillock that flaunts its rajagopuram at the peak. Other than these, there are quite some more places to be visited like the Brough church, the 100 ft high St. Mary’s church, Perimariamman temple covering a sprawling 3500 sq.ft area, Mahimaliswarer temple, Government museum, Vellode bird sanctuary etc.